This two-day course offers the chance to learn two printmaking techniques whose roots can be found in traditional printmaking. 8 places, age 16+, no previous knowledge required, materials included. The reproduction of images or text through printmaking has a long-standing tradition reaching back to 618 AD in China. Today, printmaking practices range from highly skilled craftsmanship to simple methods that can be employed at home. This two-day course offers the chance to learn two printmaking techniques whose roots can be found in traditional printmaking. Replacing expensive and heavy machinery with portable equipment such as table-top presses and everyday household materials, participants will be instructed in the creation of versatile lithographic and intaglio prints. 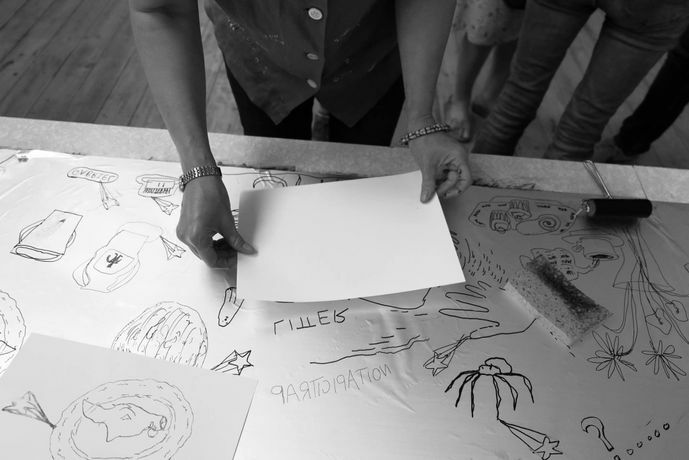 Through discussions and practical work, the course will enable participants to develop a broad range of prints individually as well as to engage in collaborative making and to explore and challenge concepts around editions, authorship, originals and multiples. On the second day, the practical course will be complemented by a visit to the Print Studio, Toft, run by Kip Gresham. * Participants will have a unique insight into the professional field of creating artist editions; renowned print-maker Kip Gresham has worked with artists Stephen Chambers, Andrea Büttner, Paul Coldwell, John McLean and many others and will expand on his experience of working with artists in the context of printmaking. *The Saturday morning session will begin at the Print Studio, Toft, CB23 2RL. Please let us know if you are unable to make your own travel arrangements between Toft and Wysing for the afternoon’s session. Lisa Wilkens was born in 1978, in Berlin, Germany. Her work is fundamentally based in drawing and the understanding and exploration of images, their reproduction and development through drawing. She has a degree in scientific illustration from University of the Arts, Zurich Switzerland studied for an MA in printmaking at Camberwell College, University of the Arts London. Her work was selected for Bloomberg New Contemporaries 2011 and exhibited at the SS1 space Sheffield and the ICA in London. Further exhibition venues include Kettle’s Yard Cambridge, Saatchi Gallery, Block 336, Brixton, ART ROTTERDAM, 68 Projects Berlin, and Kir Royal in Valencia. She had her first solo exhibition at PAPER in 2015, which was reviewed in the December edition of Frieze. Lisa works as a printmaking tutor at the Curwen Print Study Centre in Linton, Cambridgeshire. Kip Gresham is one of the most influential and experienced printmakers working in the UK. He has been involved as a director in the running of prominent studios such as Curwen Chilford and Gresham Studio. He is currently Director of The Print Studio, Cambridge, a professional collaborative printmaking studio and publisher of artists' original prints.Over his 40 year career as a printmaker, Kip has worked with major artists such as Elisabeth Frink, Peter Blake, Eduardo Paolozzi, Terry Frost and John Hoyland. Please note we are unable to offer refunds under any circumstances.